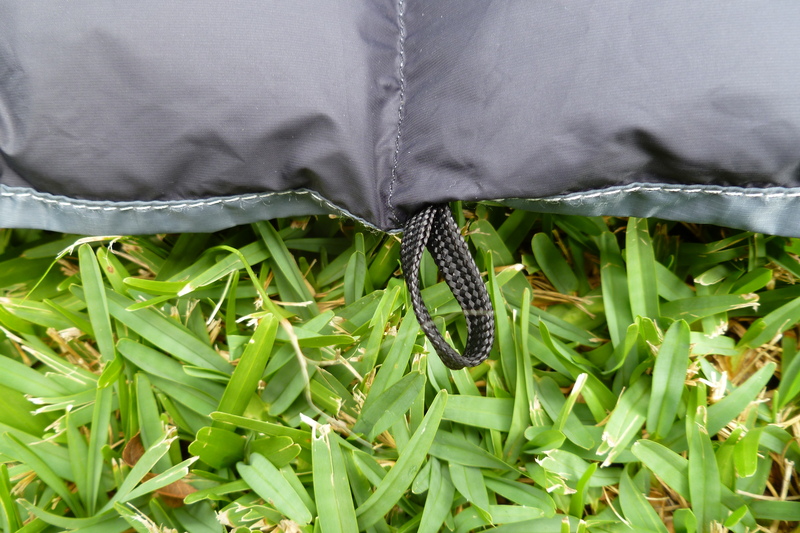 At this time, the 50 F Burrow (formally the 45 – 50 F Burrow) was not listed on the Hammock Gear site, there was only the Summer Burrow. However, the Summer Burrow very nearly matched the quilt I was waiting on, but at a much lesser price point. So, between Raul’s video and the new-found quilt, at 27 weeks I decided it was time to go another route. By the time I had the money back in hand and was ready to order, I noticed that Adam had a new quilt posted on his site, the 45 – 50 F Burrow. This was exactly what I was looking for! Our summer temperatures are very hot, and to be quite honest, a down quilt may be overkill, but IMO, it is not useless. So, with this in mind, I wanted a pretty minimal quilt. The difference between Adam’s Summer Burrow and the 45 – 50 F Burrow is that the Summer Burrow is actually baffled, whereas the 45 – 50 F Burrow is sewn through. Considering I wanted to use this quilt in warmer temperatures (but still be able to somewhat handle an out-of-nowhere low temp of around 40 F), baffling was actually overkill, again, IMO. Sewn-through construction would provide warmth down to temperatures I wanted, but more importantly, it would save weight… Not to mention that the listed price for a (stock) 45 – 50 Burrow was almost half the price for which I paid for my initial quilt! So, with a still lingering memory of my recent experience in ordering a quilt in which I never got, I decided to call Adam on the phone and speak with him about the quilt before ordering. First off, I wanted to get an estimated time frame from order to arrival. As well, with the extra money I had, I wanted to ask about using some different materials to hopefully lighten the quilt up a hair more, if possible. So, I called, the phone rang about 3 or 4 times and then I spoke with Adam for about 25 minutes about the quilt and different options. When I hung up the phone, I had decided that I was going to order the 45 – 50 F Burrow. But, there were a few things I wanted to do different from stock. First, I wanted to use M90 for the shell rather than the stock 1.1 Nylon Ripstop. However, in order to do this, I had to order the material and have it shipped to Adam’s shop since he did not carry this material. So, I placed my order through Thru-Hiker.com on a Thursday afternoon, and by Monday morning, the material was in Adam’s shop! Next, rather than going with the option of the snap closures for the foot box, I chose to use some new Velcro for the foot box closure that Adam had just gotten in but had not yet put up on the site as an option. I did not like the idea of snaps because I could imagine getting my feet tangled up between the snaps. However, I did like the idea that the Velcro would completely seal the foot box up and this way my wandering feet would not get caught in the snaps. (Also, I was under the impression that this new Velcro just might be slightly lighter.) Although, I did not rule out snaps all together. I also imagined myself accidentally pulling the Velcro apart with my legs at night if I moved around much, so I asked Adam for a single snap to be placed at the top of the Velcro to help reinforce the Velcro closure. So, the morning after I ordered the M90 from Thru-Hiker, I placed the order for my new custom quilt from Adam! Then, 39 days later I received my quilt. After waiting a full half a year (and a few days) for a top quilt I never received, well, I will simply say I was just ready to finally get my top quilt. So, I wanted to add all this reading in (if you are still reading) to say that I may have been a bit impatient. 19 days after I placed the order for the top quilt, I placed my order for my Cuben Fiber Phoenix UQ. When I placed the order I also sent an email (late at night mind you) inquiring about using different materials on the UQ as well as asked about the progress/status of my TQ. Jenny returned my email that same night (somewhere around 10:30/11:00 pm) and informed me that the quilt was sewn and waiting for the down which would be in by that Friday. She also told me that the quilt would ship that weekend, or early the next week. However, it ended up being 15 days later before the top quilt would ship, and then 5 more days before it was on my doorstep (it was a holiday weekend). So, what are my thoughts on the quilt??? Weight: To be honest, I was hoping that the M90 would cut more weight than what it looks like it may have. The stock 50 F Burrow on the Hammock Gear site is listed at 12.2 oz, and based on this weight, the M90 (may have) only cut 0.3 oz off the total weight. My particular quilt (without the stuff sack) is 12.9 oz, with one extra oz of down. If I subtract the 1 oz of down, then I end up with a 11.9 oz M90 (near) version of the stock 50 F Burrow, which is only a 0.3 oz difference. If this is actually correct, I now wish I would not have spent $60 more on the M90 and just went with the stock 1.1 ripstop. To make matters worse (not really, just a saying) the new 7d material is an option on the Hammock Gear website for the 50 F Burrow which happens to be even lighter than the M90 and at $50 is less money than what I paid for the M90. Not to mention, Adam has the 7d in stock, so I wouldn’t have had to go to another source for the material, which basically means, less hassle (not that it was though). Something else worth considering, from my understanding, the listed stock quilt weight does not use the Velcro option for the foot box, but rather the snaps. Initially when I spoke with Adam, I was under the impression that the Velcro would be equal to or slightly less than the weight of snaps. At this point though, I have no way of knowing unless Adam were to measure out the appropriate amount of snaps and the appropriate length of Velcro and then compared the weights. One other fact to take into consideration are the 4 extra loops that he installed along the sides for me to cinch the quilt up. Again, I am not sure on how much weight these 4 loops add, but I really don’t see it as more than about 0.1 oz total, but I have no way of knowing for sure. Temperature Rating: Even though this quilt is a “50 F” Burrow, I am hoping that (with the extra oz of down) I can push it closer to 40 F, just in case. Many that own Adam’s quilts have stated that his quilts are actually a little warmer than rated, although I do understand that everyone sleeps different. Of course though, if temperatures are expected to be closer to the 40 F mark, I will be sure to bring adequate clothing (such as my Montbell UL Down Inner Parka) to supplement the quilt (just-in-case) So, I must admit that I am looking forward to pushing the temperature rating on this quilt! But until then, I cannot adequately comment on this. Also, when I first measured the head end, I came up with 48 inches all stretched out, but I later realized that the cord lock was a tiny bit cinched. When I let it completely loose, I then got 49 inches, which is still 1 inch narrower than listed on the site. This however, will be one area I have to watch while using the quilt on the ground, which I plan to do. Being a side sleeper I need all the width that I can get, so this will be a real test for the quilt. So, to help me battle drafts sneaking in the close-cut sides, Adam added 4 loops to the sides which I can run a cord through to cinch and hold the quilt shut around me (much like a mummy-style sleeping bag). As far as using in a hammock, the width is more than adequate. Also, I really love that this quilt will completely open up flat rather than have a permanently sewn foot box. This will come in very handy for me on those nights that are a little too warm and I need all the ventilation that I can get. I can leave the quilt completely opened up and drape it over me, rather than having to put one leg inside the foot box and one out, which is a little more comfortable. On the other hand, I like the Velcro because it will completely seal up the foot box when I need to stay as warm as I can. And speaking of the Velcro, I want to add some thoughts about it. I do like the simplicity of the Velcro, and I love the end result (as mentioned in the above paragraph). However, I have found that the edges of the Velcro are pointy, and they will scratch against my legs. Also, if I don’t make sure that the Velcro is evenly stuck together I can also feel the uncovered areas of the Velcro rubbing against my legs. This alone would make me reconsider the Velcro option on any other quilts. (I have no knowledgeable use of the Omni Tape, but I wonder if it would act different.) Maybe if there was a way that the edges of the Velcro could be rounded, or even buried inside the quilt somehow, I believe that this option would then be better. So, I think that that about sums up my thoughts on my custom Hammock Gear 50 F Burrow top quilt. Overall, I am happy with the quilt. This thing has really grown on me and I have found myself using it as a regular blanket even inside! It is soft on the skin and the down is so fluffy and comfortable, and warm. As well, the stitching is super! No flaws anywhere! Simply amazing. I look forward to using this thing for a long time! Stick, in the two years that have passed since your last responses, are you still using the Burrow 50? If so, how’s it been working? If not, what have you moved on to? Thanks! I still have it, however, it is what I let others use when going out. 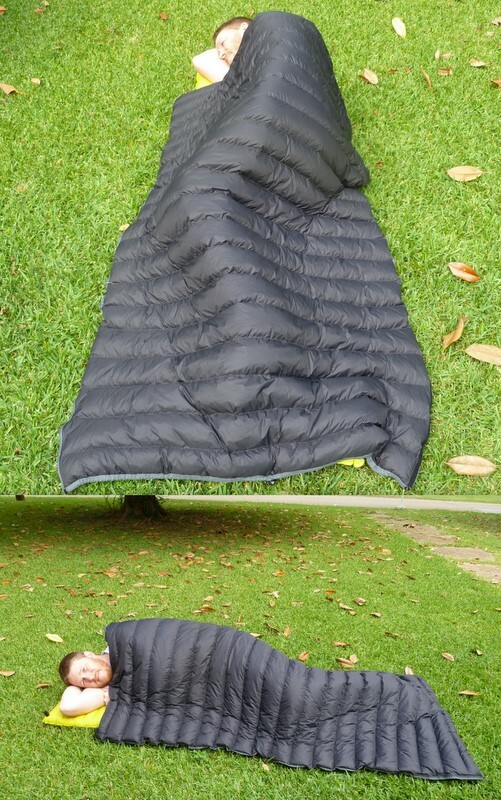 I have come to prefer my enlightened equipment custom carrot quilt. It is made from gen 1 M50, with 2.5oz/sqyd climashield apex. 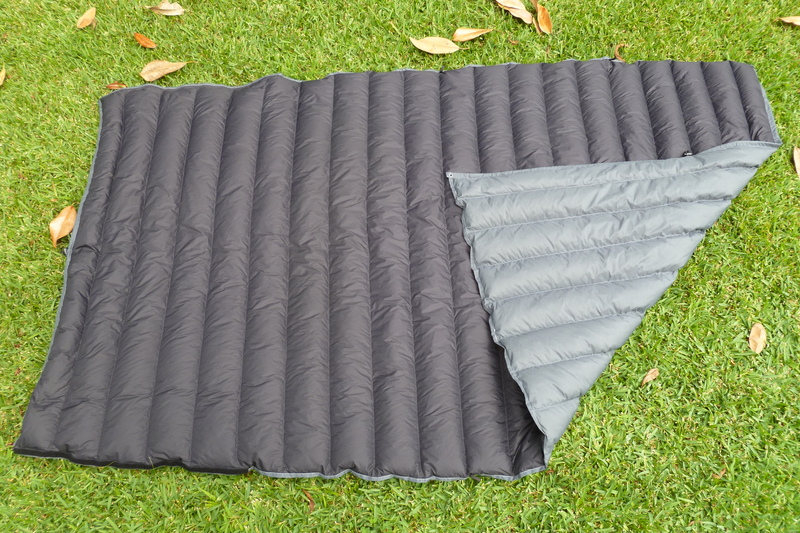 Same temp rating as this HG quilt, however, it both longer and wider, has the same temp rating, synthetic rather than down, and is 1.4 oz lighter! Plus, on the ground, the draping effect is much better than the HG down quilt, so it actually seems to keep me a little warmer, however, it’s not much I would say… it just feels more comfortable. Anyway, nothing wrong with the HG quilt, it just doesn’t win out for summer time quilts for me. Did you consider using a small nylon coil zipper, instead of the velcro footbox closure? Just wanted to thank you again for your help in March this year. I now have opted for the Burrow made by HammockGear. Since I wanted to have a quilt for my tent in the Alps (and maybe the hammock as well) I ordered a 20°F quilt. And for unheated places and for summer camping I ordered a 40°F quilt as well. Both are in green/black, half-tapered, 79” long (long version) and 55” wide (wide version). My impression is that they are a good choice. However, I have not been able to field test them so far. 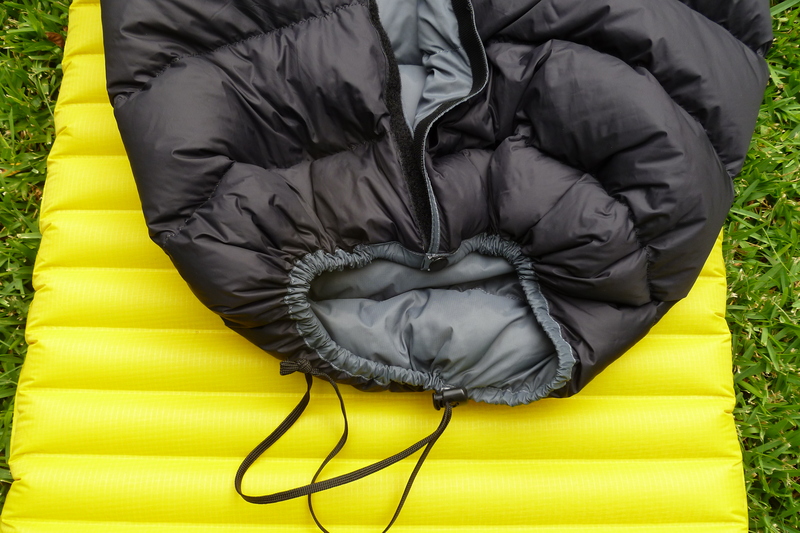 Although, Enlightened Equipment make great products (I especially like the shiftless baffles), their quilts are slightly heavier than the Hammock Gear products. Maybe, the zip on the EE products is one of the reasons, I don’t know. So, I have chosen Hammock Gear this time. I am looking forward to try one of them out in early July in the Swiss Jura Hills (around 3,200ft above sea level). Which one I am going to take with me depends on the weather then. And another question: Do you guess the quilt can easily be used inside out? So the outside color could be changed according to the quilts use (more or less visible)? Check out my response on your other question. The quilt in this article is black on gray. Technically, the inside is gray and the outside is black, however, the quilt can be used with either side up when it is unbuttoned/opened up. It could be snapped closed with the black on the inside, but it is not intended to be used like this. However, most companies allow one to choose from a number of different color options. Enlightened Equipment has the most color options I have seen offered from companies that sell quilts. I have 2 other quilts though. One is all orange which is my summer quilt. 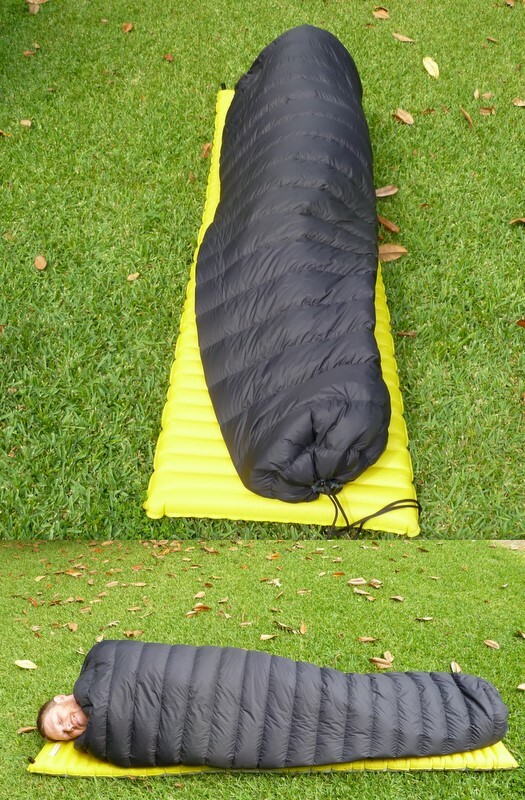 It is a custom quilt from Enlightened Equipment that uses 2.5 oz/sqyd Climashield Apex, is larger than this Hammock Gear quilt, and actually weighs a little over an oz less. I also have a older model Prodigy quilt (slightly different from the current Prodigy quilts) from Enlightened Equipment which is gray on the inside and Aspen Green on the outside. Thank you very much for coming back to me so quickly. I have the same thoughts about dark colors and drying out a sleeping bag or quilt. I’m thinking about getting a quilt in black/green just for this reason. Hammock Gear seems to have quite a range of colors as well now compared to Enlightened Equipment. Which of the two companies would you rather recommend just in respect of workmanship? I have got quite a good impression oaf Hammock Gear so far. A black on green quilt will be nice… to be honest, I like pretty much any color, as long as at least one is black. I honestly haven’t checked out what Hammock Gear has to offer in quite a while. I do know that they now offer different widths (which is great) as well as either a straight, or half tapered cut. 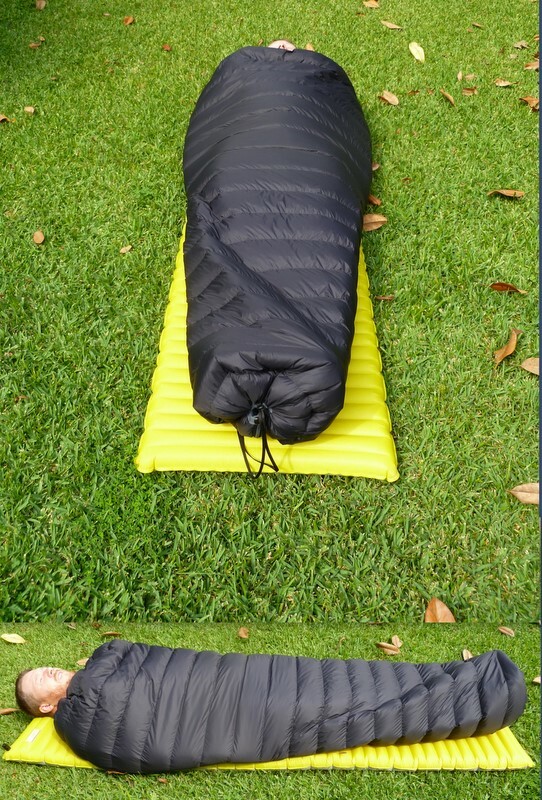 IMO, as far as the cuts are concerned, for ground sleeping, a half taper is ideal as it is easier to keep your torso covered, otherwise, in a hammock, the straight taper is ideal since it cuts weight and you don’t need as much width. Also, as I mentioned before, it is a good idea to make sure that your set up will work on the ground too, should the need arise, however, this should not be too often, if at all, so deciding on the cut is a personal choice. I can’t say if that size will work for you, but for me, at 5’10” and about 200 lbs, my 56″ quilt is about right. If I were to buy another quilt (for the ground use) I would not go any narrower, and if I were to get one for say 10 F or so, I would go with one around 58″ wide. As far as HG vs EE, I think that you will be happy with either option as far as quality is concerned. So, I would suggest to compare their offerings (size, weights, cost) as well as wait times and then go from there. I will say that my interactions with Tim Marshall at EE was very speedy though… a number of times we would exchange a number of emails within a minute or 2… he was definitely on top of it! Anyway, I hope this helps some, and good luck with your decision! Thanks for coming back to me. Since I would like to use the quilt for ground sleeping as well, I have been thinking about getting a half taper (not half-tempered, of course;). 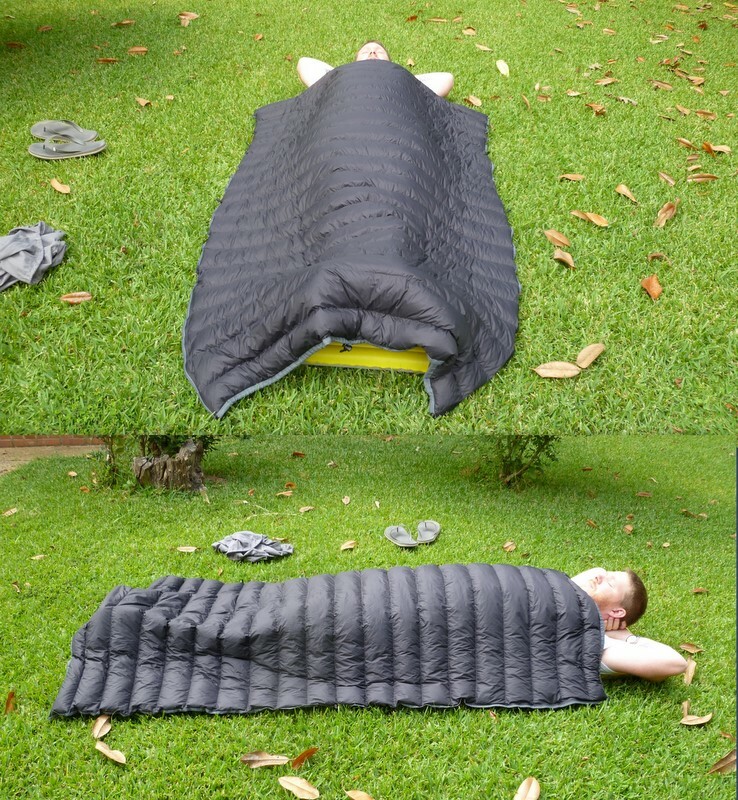 I have had a Therm-a-Rest Alpine Down Blanket (35°F) for quite a while and was happy with the concept. Unfortunately, there has been a problem with some of the torso baffles that weren’t filled with enough down. So, I would end up with just two thin layers of nylon fabric on me. So, I really like the concept and the freedom of movement with a blanket or quilt but just guess I need something of better quality. 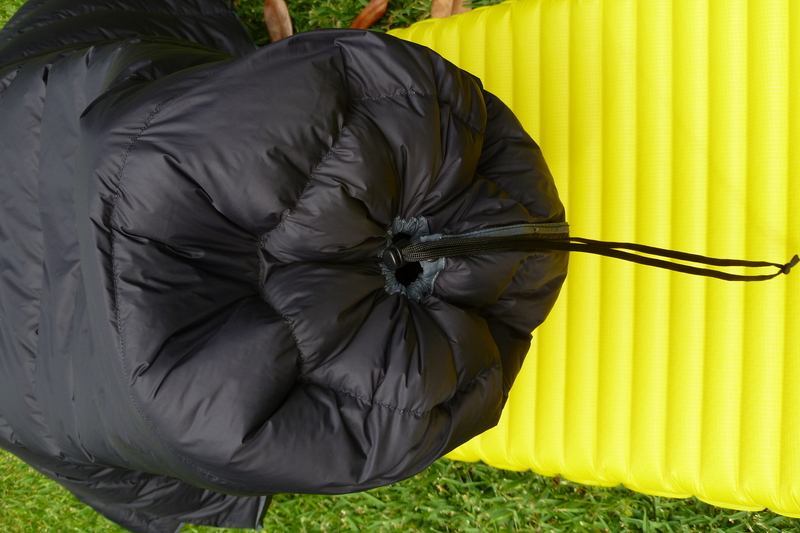 When comparing the Alpine Down Blanket with the HG or EE products, I realize that the Alpine Down Blanket isn’t the lightest product available. That’s another point for cottage manufacturers / smaller companies like EE or HG. I tend to stick with my first thoughts (HG) but will definitely have a look into EE as well. Thanks for mentioning that company to me.